I worked with LAMO a few months ago on some nice shoes. They are so comfortable and I wore them most of the summer. But now that winter is quickly approaching I wanted some nice new, warm boots. LAMO released a new line of shoes just this year. Dije California has Boots and mocs that are perfect for that approaching winter! When I put in the order for my boots Avery was wearing a 12. Then overnight she skipped 13 and went straight to 1s. These are 13s and they JUST fit her. She has been wearing them, but I know we won't get a lot of use out of them and they definitely won't last all winter. HOWEVER, they are holding up incredibly well. For a 7.5 year old who has recess every day as well as just going to school in general she is hard on shoes and these are wonderfully awesome. She hasn't lost any sequins or anything like that yet. They are put together really well and are of high quality. My boots are AMAZING!!! They have a nice rugged sole, so they will be perfect all winter, but are super warm with the fur inside. They have been great. I've only worn them a couple times so far since the weather can't decide what it wants to do here in MI. One day it's summer again (73 on Sunday) and the next it's winter (43 yesterday). So I haven't had a chance to wear these too much, but so far they seem like great quality as well. I really love the sole on them. They will definitely hold up well. They are suede upper with skeepskin inner and insole. SO soft and warm. Price: My boos are $95. Which is a fantastic price for Sheepskin/Suede boots!! My Sequined are $42. Overall: ***** LOVE our boots! For the hop, Dije is offering The Sturgis Boot to one lucky winner!!! Hop goes live on the 3rd at Midnight and will only have 1 entry option! 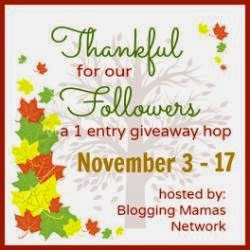 ALL the giveaways in this hop will have 1 entry! AWESOME!